Grant Achatz, an award-winning American Chef from USA, is one of the leaders in molecular gastronomy. For 6 weeks in Madrid, Grant and his team from his 3 Michelin Star Chicago- based restaurant ALINEA, offered a unique dining experience to the lovers of haute-cuisine. Organised at the NH Collection Eurobulding Hotel, the public was invited to enjoy an exclusive and holistic gastronomy experience, as well as the architectural surroundings. The main challenge of this project was to move the entire restaurant from the US to the Spanish capital. In order to achieve this, the international interior designer, Lázaro Rosa-Violán, inspired by the “cladestine and nocturnal” atmosphere of the 80s Chicago look, specified Neolith for the worktops and kitchen islands. 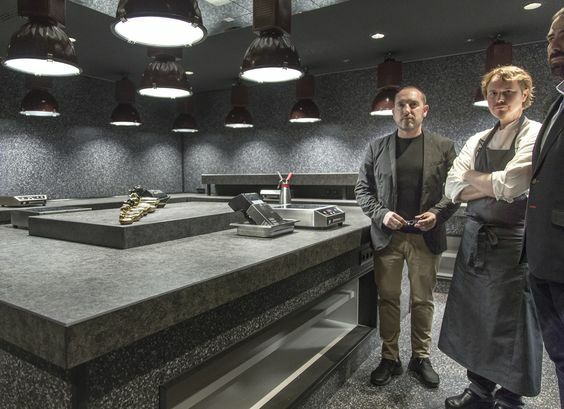 The kitchen area was entirely open, so the public could be at the centre of the action: Chef Achatz and his team of 50 preparing exciting dishes with local products. Designer Lázaro selected Neolith Belgian Blue to be the hero product of the kitchen, complementing the architectural elements of the building. Grant Achatz said that “the final result overcame his initial expectations”.